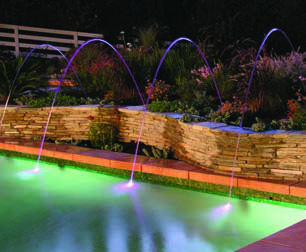 Sheer Waterfalls project a gentle continuous sheet of water into your pool. It is available in a variety of sizes, there is a model to suit your particular requirements. 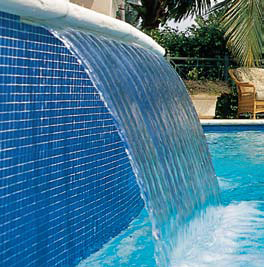 Rain Waterfalls project separate streams (like rain drops) of water cascading into your pool. 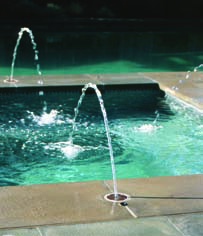 Deck Jets are installed in the pool coping, and project steady streams of water in an arc into the pool. The flow and projection angle can be adjusted to create different effects. They can be partially illuminated with button lights mounted in the pool coping adjacent to the jet outlet. Wall Jets are a similar product but are designed specifically to be wall mounted. They have square plastic cover plates, and are available in four different colours. Laminars produce smooth single stream arcs of water, which can be illuminated using single colour LED lighting, or multi colour LED or fibre optic lighting. The smooth flow effect is so good on a still day, they resemble glass rods rather than water, except for the slight splash where the water enters the pool.